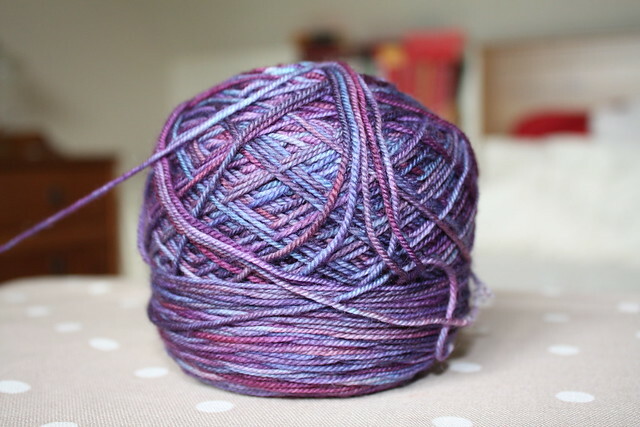 I believe I have issues with the colour purple, not the book, but yarn dyed the colour purple. See that there? that is a ball of Malabrigo Sock in Abril, it is beautiful (if you ignore the ball winder injury sustained on the right) but I cannot knit it. There is something about purple that is making me shy from patterns, nothing is quite right, nothing quite fits how I want my finished project to look, nothing suits the colour variegation in the skein, nothing is darn good enough. I have so far tried to knit 2 patterns from this skein, Travelling Woman and Kleio, both beautiful patterns in themselves, but thank god this yarn is great at keeping its tension when it has been frogged because otherwise I would have wasted £12. I want to knit a scarfy/shawly thing that I can wear to work, I want it to have a considerable amount of lace with a minimal amount of block stockinette or garter stitch because I really am not fond of variegated yarns in blocks of standard knitting, the pooling never seems to look nice to me. I have trawled the Ravelry project pages for this particular shade of Malabrigo Sock, a favourite past time of mine when I haven't a clue what to knit a lovely yarn into, and nothing is jumping out at me. Despite my rules I am tempted to try a 'holey' wingspan shawl as project number 3, or buy another skein in a complimentary colour and knit either Colour Affection or Stripe Study Shawl (I could always use that periwinkle yarn I couldn't knit before I suppose) all of which could result in more pooling vomit and frogging. I could of course simply give in and make some socks. One can never have too many socks.